New York City Environmental Protection (DEP) Commissioner Carter Strickland today announced that DEP received a top honor at the 2013 American Council of Engineering Companies of New York’s (ACEC New York) 46th annual Engineering Excellence Awards. DEP, and two of its research consultants, Hazen and Sawyer, P.C. and CH2M Hill New York, received ACEC New York’s Empire Award for research and development of cutting edge nitrogen removal technology at the 26th Ward Wastewater Treatment Plant. The $2 million joint research and development project resulted in advances to the wastewater treatment process that has reduced nitrogen discharges from the plant into Jamaica Bay by more than 3,000 pounds each day. ACEC’s Empire Award is given to the highest rated project in New York State based on contributions to the economic health of an area, sustainability, innovation, and creativity. DEP’s work was led by Deputy Commissioner Vincent Sapienza, Allen Deur, and Keith Beckmann. Nitrogen is a naturally occurring element that is found in food and other organic materials and is present in wastewater when it enters treatment plants. Because nitrogen is not a pathogen and poses no threat to human health, the wastewater treatment plants were not originally designed to remove it from the treated water before it is discharged into the receiving water body. However, high levels of nitrogen can degrade the overall ecology of a waterway by reducing levels of dissolved oxygen and promoting excessive algae growth, especially in warm weather months. Nitrogen is present in wastewater in the form of ammonia, which is broken down during the secondary treatment process. The nitrogen reduction technology at the 26th Ward Wastewater Treatment Plant, the first of its kind in the world, removes nitrogen from the treated water by adding glycerol, a high carbon biological byproduct of biodiesel production that is non-hazardous and non-flammable, to a dedicated separate centrate aeration tank at the plant. The discovery of this nitrogen removal process helped DEP avoid having to develop a $30 million ammonia recovery system or introduce the more commonly used chemical, methanol, which is highly toxic, flammable, and can be hazardous to wastewater treatment plant operators. In total, the new system reduces nitrogen discharges at the plant by more than 3,000 pounds. The 26th Ward Wastewater Treatment Plant went into operation in 1944 and serves more than 283,000 residents. Located in eastern Brooklyn, it treats up to 85 million gallons of wastewater a day and up to 170 million gallons during wet weather events. 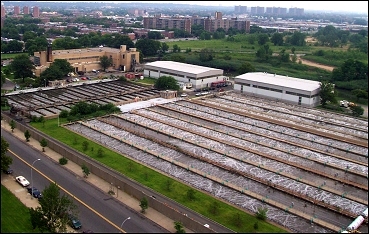 New Yorkers produce, and DEP treats, an average of 1.3 billion gallons of wastewater every day. The wastewater is collected through 7,400 miles of lateral sewers that flow downhill by gravity or pumping into large interceptor sewers, which lead directly to the city's 14 wastewater treatment plants. Jamaica Bay is a 31-square-mile water body with a broader watershed of approximately 142 square miles, which includes portions of Brooklyn, Queens, and Nassau County. The bay is a diverse ecological resource that supports multiple habitats, including open water, salt marshes, grasslands, coastal woodlands, maritime shrublands, and brackish and freshwater wetlands. These habitats support 91 fish species, 325 species of birds, and many reptile, amphibian, and small mammal species. Jamaica Bay is one of the City’s most unique natural environments and restoring it is a top priority for the Bloomberg Administration. DEP has committed more than $100 million to reduce nitrogen discharges from the four wastewater treatment plants on the Bay by 50% over the next ten years and nearly $20 million to wetland restoration projects. DEP is also investing more than $1 billion to reduce nitrogen discharges from the four Upper East River wastewater treatment plants - Bowery Bay, Hunts Point, Tallman Island, and Wards Island - which will reduce total nitrogen discharges from the four plants by more than 52 percent. The work is being funded by DEP and is the result of an agreement between DEP, the Office of the New York State Attorney General, and the New York State Department of Environmental Conservation (DEC). Activating these advanced treatment technologies is a key component of DEP’s Strategy 2011-2014, a far-reaching strategic plan that lays out 100 distinct initiatives to help make it the safest, most efficient, cost-effective, and transparent water utility in the nation. In addition to reducing nitrogen discharges, since 2002 DEP has invested approximately $10 billion in wastewater treatment plant upgrades to increase capacity and reduce combined sewer overflows (CSO). Capital investments have included the construction of four CSO storage facilities with the capacity to hold approximately 120 million gallons of wastewater until it can be properly treated. These storage facilities reduce CSOs by more than 2.7 billion gallons annually. Conservation methods, improved operational practices, and regular cleaning of interceptor sewers have also reduced CSO volumes. Last year, DEP completed a two–year cleaning of the city’s largest interceptor sewer pipes using vactor trucks, removing more than 29 million pounds of debris and sediment and reducing CSO discharges by more than 100 million gallons annually. Since then, DEP has continued the process of inspecting and cleaning these sewers using other methods which have combined to remove an additional one million pounds of debris. Under the NYC Green Infrastructure Plan launched by Mayor Bloomberg in 2010, DEP will also invest more than $187 million over the next three years and an estimated $2.4 billion of public and private funds by 2030 to reduce CSOs by capturing stormwater before it ever enters the city’s combined sewer system.